Silvio joined Watsi on August 24th, 2015. 10 other people also joined Watsi on that day! Silvio's most recent donation traveled 4,300 miles to support Mary, a 36-year-old day laborer from Kenya, to fund burn repair surgery. Silvio has funded healthcare for 13 patients in 7 countries. “I have suffered enough,” says Mary, a 36-year-old woman from Kenya. “I hope be treated soon so that I can get back to helping my husband raise our children.” Mary and her husband have three children, aged between eight and 13 years old. Mary used to earn money for the family by picking tea as a day laborer. Lately, however, she has not been able to able to do this work. In December 2012, Mary—who is epileptic—had a seizure and fell into the kitchen fire. She sustained serious burns to her right hand and was hospitalized for two months. Despite this lengthy hospital stay, the burn did not heal correctly. Contractures, or tight, thickened patches of skin, formed where the burn had been. Three years later, Mary still experiences pain and numbness in the right hand, especially during the cold season. She is also unable to extend her fingers completely. Mary had a graft surgery in 2014 to begin to address this problem, but will need more operations to fully correct it. Her doctors have scheduled her for contracture release surgery on September 25. But because the contractures have decreased Mary’s ability to work, her family’s income has dropped. They need your help to pay for her surgery. $1,176 will sponsor Mary’s operation, as well as her lab tests, medications, and nine-day hospital stay. Let’s make sure this mother can return to good health so she can begin earning money again to support her children. Ruth is a 14-year-old student who lives in Haiti with her mother, grandmother, and sister. She enjoys going to school and to church, and Ruth would like to study to become a nurse. Ruth suffers from mitral regurgitation, which she contracted from a rheumatic fever several years ago. With this condition, blood leaks backward into the left atrium and could result in heart failure if not treated. Our medical partner, Haiti Cardiac Alliance, is requesting $1,343 to fund Ruth's air transport to the Cayman Islands, where her treatment is scheduled to take place on July 5. Once there, Ruth will receive the care that she needs and will hopefully be able to live more comfortably. "I am a little scared of my surgery, but I know that God will protect me and make everything go well," says Ruth. Pech is a 23-year-old farmer who lives with her husband, son, and two daughters in Cambodia. When she is not tending to her farm, she enjoys staying at home and watching TV. On February 26, 2016, Pech was in a moto accident. The moto she was on fell over and dragged her on the ground, causing a chronic wound on her upper right arm and scar contractures on her left hand and right elbow. She is in pain, and it is difficult for her to hold anything. Pech traveled three hours with her husband to reach Watsi's medical partner, Children's Surgical Centre (CSC), for treatment of her injury. Surgeons will operate to treat the scar contracture of her left hand and right elbow first, and Pech will stay at CSC to receive treatment for the chronic wound on her upper arm. They will perform a rotation flap from her lateral elbow to treat the right elbow scar contracture and a radial flap to treat her left-hand scar contracture. $392 pays for Pech's surgery as well as surgical and medical supplies and two days of food for Pech and her caregiver. Once these areas heal, Pech will regain the ability to use her hand and arm normally. Sophuon is a 20-year-old student in grade 11 who lives with her parents, two sisters, and two brothers in Cambodia. She enjoys learning English in her free time and helping her parents on the family's farm. Sophuon began having ear discharge when she was nine months old. Chronic otitis media caused a perforated tympanic membrane on the left side, and she still experiences pain and discharge and has poor hearing in her left ear. Sometimes, the pain is so bad that she cannot go to school. The tympanic membrane—commonly known as the eardrum—is a thin membrane that separates the external ear structures from the middle and inner ear. It plays a major role in hearing by transmitting sound waves from the air to the middle ear, where the waves are converted to nerve impulses that travel to the brain. The eardrum also protects the middle ear from foreign objects, water, and bacteria. A tear in the eardrum can lead to hearing loss and poses an increased risk for infection. Sophuon traveled two hours with her mom to reach Watsi's medical partner, Children's Surgical Centre (CSC), for treatment. For $399, surgeons at CSC will perform a myringoplasty surgery to repair the perforated tympanic membrane, treat the infection, and stop the discharge and pain. Funding for Sophuon also covers the costs of two days of hospital care and three follow-up appointments in the first month after the surgery. As Sophuon heals, her hearing can improve. “Due to the hernia, I cannot play soccer in comfort and I cannot lift heavy things—for example, I cannot fetch enough water from the well,” says Kyomuhendo, a 13 year old boy from Uganda. 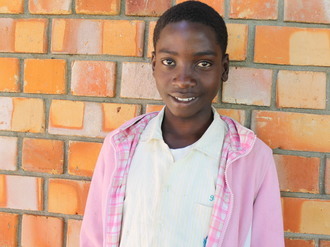 Besides soccer, Kyomuhendo also likes science and mathematics, and dreams of becoming a doctor one day. For the past three years, Kyomuhendo has had on and off swelling in the right scrotal and inguinal area, and has been diagnosed with an inguinal hernia. An inguinal hernia occurs when soft tissue protrudes through a weak spot in the abdominal muscle wall. “If not treated, Kyomuhendo will be at risk of strangulation,” says his doctor. A strangulated hernia is a dangerous, potentially fatal condition where blood flow is cut off to the trapped tissue, which results in rapid tissue death. "Kyomuhendo’s parents are unable to pay for his surgery because they have no stable income,” shares our medical partner, African Mission Healthcare Foundation. “Kyomuhendo’s father is a retired teacher and the mother is a stay at home mom.” For $220, Kyomuhendo will receive surgery to repair the hernia and strengthen the affected spot in his abdominal muscles. He will be able to concentrate in school and help out at home. Meet Alina, a four-year-old girl who lives in Nepal with her parents and two brothers. Recently, Alina slipped while walking down the stairs and broke her left leg. Alina needs surgery to reset the fracture and allow her to heal and walk normally again, without swelling and pain. Alina's aunt tells our medical partner, Possible, "even gently moving her leg makes her wail in pain. She has difficulty doing any activity that involves moving her leg." Alina needs an operation, but her family is unable to afford it. Her father works abroad in India while her mother takes care of Alina, her two brothers, and the family farm. For $224 Alina will have her fracture surgically reset so that her bones heal properly. With treatment, Alina will be able to move without pain. Alina's family has been worried about her health. Her aunt shares, "Alina has been in a lot of pain. I wish for her treatment to happen quickly so that she can feel better." Meet Kyobutungi, an expectant mother from Uganda, eager to deliver her first child. She has had a smooth pregnancy up to now, having been reassured during antenatal visits that her baby is developing well. Kyobutungi heard there was a specialist in town accepting free consultations for all pregnant women and decided to double-check on the condition of her baby. Our medical partner, African Mission Healthcare Foundation (AMHF), tells us, “Upon thorough and repeated scan examination, Kyobutungi was told that her child was safe and alive, but had presented the lower part (buttocks).” This means Kyobutungi will need a cesarean section in order to safely deliver her baby. Kyobutungi and her husband are not able to afford this surgery necessary to safely deliver their first child. Kyobutungi is a professional teacher, though she is currently unemployed. Her husband, a teacher’s assistant, supports their family, along with three of his relatives, with the little income he earns. For $160, Kyobutungi will receive a cesarean section to ensure a safe delivery. Kyobutungi tells us, “I am hopeful that the procedure will be successful and I will be able to return home with a live baby.” Let’s help make this happen for Kyobutungi and her child! Meet Julnise, a five-year-old girl from Haiti who lives with her father and three sisters. Her mother passed away when she was a baby. 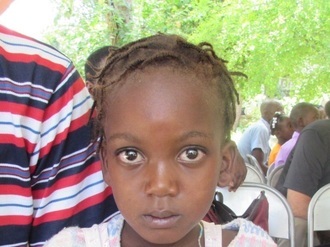 “She is a very shy girl but very curious about the world and what is going on around her,” says our medical partner, Haiti Cardiac Alliance (HCA). Julnise started kindergarten this year, but can only attend occasionally because of her congenital heart disease. Born with a cardiac condition called tetralogy of fallot, Julnise is susceptible to many symptoms. Specifically, “there is a hole between two chambers of her heart and a muscular blockage of one of the valves,” according to HCA. 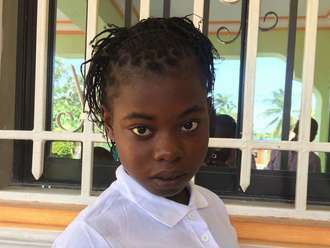 “As a result, blood cannot circulate normally through her body, and she is at constant risk of sudden death.” Julnise’s treatment is also being subsidized by Health City Cayman Islands, who are covering $7500 of the procedure. For an additional $1500, Watsi can help fund her surgery (which is being performed overseas), two sets of travel documents and plane tickets. After her surgery, HCA believes that Julnise’s heart will be able to function normally, and “she should be able to lead a normal and healthy childhood.” "Since she was little, Julnise has often passed out and fallen to the ground, and we never knew why,” says Julnise’s father. “We are very happy to know there is a way to fix this." “Our greatest wish for our daughter is to get better and go to school,” say the parents of Lah Ku, an 11-year-old girl who lives in Thailand. Lah Ku came to our medical partner, Burma Border Projects (BBP), with thalassemia—a genetic condition in which the body does not make enough red blood cells, and the existing red blood cells do not transport oxygen efficiently. This is problematic because red blood cells carry oxygen to all of the body’s organs. When an organ’s oxygen supply is inadequate, the organ cannot function properly, and symptoms such as fatigue, pallor (pale skin), and slow growth rates can result. To help control these symptoms, individuals with thalassemia receive frequent blood transfusions. “Lah Ku is visibly jaundiced and currently has frequent nosebleeds and fever, headaches, and abdominal pain,” reports BBP. “Immediately after she receives her monthly blood transfusions, she plays a lot at first and has good energy, but her energy decreases over time, and most of the time she is very fatigued.” BBP adds, “Lah Ku does not attend school because the pain from her condition is too great.” “Now,” BBP tells us, “Lah Ku’s spleen is enlarged and needs to be removed.” An enlarged spleen, known as splenomegaly, is common in individuals with thalassemia. The spleen is responsible for destroying old and defective red blood cells. In thalassemia, the rate of destruction is increased in response to the abnormal and transfused red blood cells in circulation, and the spleen grows larger due to the increased activity. Lah Ku’s parents work as farmers and barely earn enough money to pay for food and daily expenses for themselves and their four children. As a result, there is no money to cover Lah Ku’s medical care. With $1,015 in funding, Lah Ku can undergo a splenectomy (removal of the spleen) and receive seven days of hospital care and follow-up appointments after surgery. “Surgery will relieve Lah Ku's pain and allow her to attend school,” shares BBP. “She will have more energy and a much better quality of life, as she will no longer require monthly blood transfusions.” Let’s help fund surgery for Lah Ku! Saroeun is a 47-year-old wife, mother, and grandmother who works as a farmer in Cambodia. In her free time, she enjoys sewing mats. Our medical partner, Children’s Surgical Centre (CSC), tells us, “Saroeun has a pterygium in her eye that makes her vision blurry and gives her burning sensations and lots of itching. She has a hard time out on her farm because of her eye constantly tearing, and having to stop and rub them.” A pterygium is wing-shaped growth of tissue that appears as a thin or thick, white or pink membrane on the surface of the eye. The growth extends from the inner or outer corner of the eye toward the center and is typically noticed when it begins to cover the iris—the colored portion of the eye surrounding the pupil. Common symptoms include burning, itching, and blurry vision, all of which Saroeun is experiencing. $150 in funding will cover surgery to remove the pterygium from Saroeun’s eye as well as medication and follow-up care after surgery. CSC explains that, after surgery, “Saroeun will no longer have burning sensations and blurred vision.” Saroeun looks forward to returning to work on the farm without eye pain and blurry vision. Let’s help fund Saroeun’s eye surgery!